If there is one poetry book you should read in your whole lifetime, it is How I Am Different by Thom Kudla, a collection of poems, insightful and inspiring thoughts composed over a period of two years. Each thought or poem is short, concise, and succinct, an expression of an idea, a humorous look into life, a subtle piece of satire. The book is designed with a thought for each day, and this allows the reader to journey with the author, looking at his growth through the whole period of time the book was written. But I bet no reader will be able to read the book the way the author intended it to be read. Its charm is irresistible and one suddenly finds oneself going from poem to poem and from thought to thought, unable to stop. Some of the thoughts expressed in the book are witty and quotable and it won’t be hard to hear some of the lines coming back to mind in the course of the day. How I Am Different is a book in which anyone will most likely find inspiring thoughts. I highly recommend this one for those readers looking for something entertaining that could be read over a very long period of time, but it will need a lot of discipline to read this book over a long period of time. 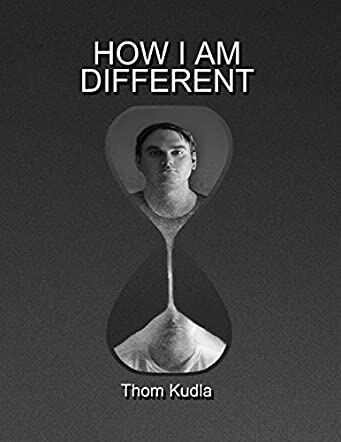 How I Am Different by Thom Kudla is a unique, non-fiction book about Thom’s self-reflections in the form of a diary. How I Am Different is written mostly in the form of poems or very short prose of a paragraph or two. The theme of the book is a journey of self-discovery. The book begins with an introduction to the project which involves the author writing in his book every single day for a year on a particular subject or theme or just about anything that needed to be penned down. This is mostly done in small snippets of thoughts and stories. The project then continues onto the next year where the author again writes something every single day that corresponds to the subject matter of what was written on that particular date in the previous year. Thus, the book is essentially a collection of thoughts, stories, poems, and prose. How I Am Different by Thom Kudla is an unusual book and certainly interesting. Although it is a novel concept, and there is some autobiographical content in these musings, at times it was hard to put a context to these thoughts written on paper. That being said, because it is such a refreshing change from an “average book”, it certainly made for an interesting read. I also found the writing to be engaging and some of the poetry to be quite moving. Also, because it does not follow a sequential storyline as such, it can be read in any order. All in all, I would recommend this book as an interesting piece of creative writing and for being refreshingly different. In a very intriguing work by poet Thom Kudla, How I Am Different is certainly a book that will keep readers of poetry turning the pages throughout. Utilizing an unusual and creative literary style, the work compares the poet's life, work and thought processes from a date one year to the exact same date the next year. The developments that he makes, both through his work and through the changes in his very life, are made obvious by this innovative comparative piece. The works of poetry are thought provoking on their own, but set the way this piece is, adds even more interest when lined up against the work from the following year. I very much enjoyed How I Am Different. Poet Thom Kudla's creativity, both with his poetry and also with the set up of his work. Poetry is such a unique and personal format of writing to begin with, but this exploration of the changes from one year to the next is simply fascinating. Those who enjoy poetry will like his work in general, but will certainly love this added element to explore. I am pleased to be able to recommend How I Am Different to any reader who enjoys poetry, or anyone looking for a creative work with a unique slant. I certainly hope that the very talented poet Thom Kudla continues his work in this direction, and I personally would love to see a second volume of this work with a daily entry five years from now as well! How I Am Different, a new work by poet Thom Kudla, is both of book of poetry and a sociological study of sorts. Using poems written on the same day of two consecutive years as a comparative study of his own life, this is a work that is completely unique and one that readers will find endlessly fascinating. Using several spreadsheet type guides to assist readers in finding the corresponding poems, Kudla's second year poems serve as a response to the one written on the same day the year before. Reading the poem and then the response truly does show "how the author is different," and explains the title of the work perfectly. How I Am Different is a book of poetry that this lover of all things poetic found incredible. Seeing how poet Thom Kudla progressed with both his poetry and his life through his work was an amazing experience and one that many readers, and not just those who enjoy poetry, would find interesting. Any reader who enjoys poetry, sociological studies, or anyone looking for a read that is different from most of what they've encountered before should pick up this collection and read it as soon as they get a chance. It's easy for this reviewer to recommend this book, and I certainly look forward to reading more from the obviously talented poet, Thom Kudla, in the very near future. Mr. Kudla, I hope you already hard at work on your next effort as I, for one, will be eagerly watching for it! How I Am Different is much more than a book of poetry with the addition of some prose and non-fiction entries. Thom Kudla decided to use the modern passion for scientific analytics to add interest to his creative work. The title, How I Am Different, gives a clue to the development of the contents. Every day for a year, Mr Kudla wrote an entry about whatever he was feeling, or a subject that caught his interest. Throughout year two, the entries are disciplined; each referenced directly back to the same day in year one. The book has an extensive and detailed genre index for the use of readers who wish to choose an area to read, rather than going straight from the beginning to the end. Thom Kudla has shared an intriguing peep into his life and his development as a person in How I Am Different. The clever layout allows a direct comparison of the author’s self in year one and what he had become when he reached year two. I read it in order; I found the natural progression of a year added interest. My favourite day is number fifty-two, a short poem entitled Buyer Beware: “She was damned so she sold her soul. There is no screening for souls on the market. Buyer Beware.” followed by Buyback, in which “she” saves to repurchase her soul. Second favourite, for me, is prose, Running at Sunset and Walking by Moonlight. I loved I How Am Different; it is fascinatingly different. How I Am Different is an amazing experimental work by Thom Kudla. I think it is an experiment every writer should do. I’m going to do it, even if I never publish the results. I have been told to journal from my very first writing class in high school and I can think of no better use for such a journal than to see How I Am Different. I know that I change, but it is very difficult to pinpoint when or why these changes occur. I love this idea. I love this book. I think the idea, the format, and the final result are spectacular. I think Thom is a real working writer. It doesn't hurt that he was inspired by one of my childhood heroes, the legendary Ray Bradbury. I like the layout of How I Am Different. The whole idea is a stroke of genius. I loved looking at the differences and I sadly related to how often things don’t go as planned or just plain disappoint you. This book is a different kind of book so I have to give it a different type of review. The writing is excellent which helps to catapult a great idea into a very good book. The layout and organization follow a logical and organized system, making it easy to accompany the writer on his journey through change. I think How I Am Different is a must-read for writers old and young. I recommend it to anyone even slightly interested in self-awareness. Some serious philosophical musing and a whole lot of poetry and fun!